Clockwise: Fabrics for Chloe's chair; Bakerella cake pops; Purl Bee garland; Ikea Duktig tea set; vintage child's apron by Swankythread. We inherited a whole bunch of mismatched tea cups and saucers from Mama HandyLuster so I'll be incorporating those somehow. I also have many doilies that I didn't use in Chloe's doily art piece that I'd like to use too. Maybe I'll dye them like Eddie did? One thing I've started on is the invitation. I came up with this poster-style invitation based on trendy wedding Save The Date cards I'd seen on sites like Style Me Pretty. (Wedding sites are such great sources of inspiration and have lots of pretty eye candy!) I'm not sure what I prefer, the silhouette or Chloe's pic...which one do you like? Of course, there's still lots of time for me to plan and prepare...and change my mind about things, lol! I really want to make this first birthday party special and sweet and fun. Tell me, have you had any memorable birthdays? What made them special? The cake? Your party dress? The miniature pony you got as a gift?? Spill the beans. I like Chloe's picture- she looks super cute! The one with Chloe's face is so cute! I never had fabulous parties like this, but I will definitely make it happen for my kids! I love the invitation, and I like the one with the silhouette best. 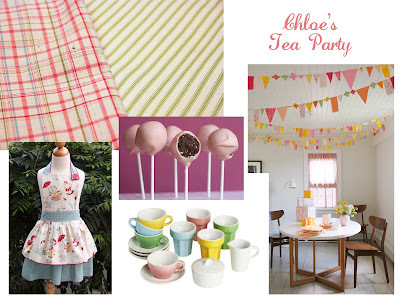 Love the tea party theme idea! We just threw my daughter a first birthday party and did something cute with her cupcakes...check it out! Love the idea of a first birthday tea party. So cute! I love the invite with Chloe's face on it. That is SUCH a cute invite! How did you make it? I like the silhouette: it seems to fit with the vintage theme. Good luck! She's so cute! I remember our sons first birthday well. We invited over 50 people and planned to have a huge outdoor BBQ. The day of we had torrential downpour! We had to hang tarps over the porch and between cars so everyone could fit. Chaotic day but amazingly fun! 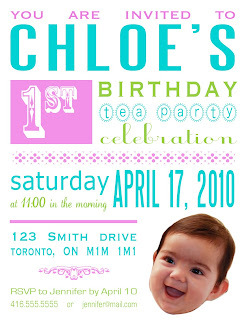 I like the invite with Chloe's face. She is too cute not to feature! Such cute ideas. Our kiddo's birthday is on 12/31, so we have always had a New Year's Eve Day brunch. On his first birthday, the poor guy was sick, so he did not have much fun at his party. But everyone else did. I think the rule of thumb is to invite only as many children as the child is old--but I think that guideline doesn't apply to one's first birthday. Come one and all for that amazing milestone! your baby is adorable, but I like the silhouette. It looks very classic! I love the idea of a tea party!! How on earth are we at the stage of planning birthday parties, didn't we just bring our babies home from the hospital yesterday? 1 more vote for Chloe's sweet face--- soo cute!!! Love the mood board! There are lots of "how to" guides for making the pendant flags! ;) Can't wait to see what you come up with! 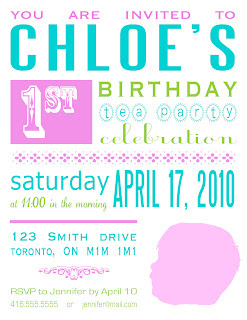 I agree that the invite with Chloe's cute face is a winner. Your ideas look fabulous. Can't wait to see it all come together! I can't believe a year is almost here for Chloe--she is just precious!! I love the ideas that you have come up with! I'm sure you will keep us posted.